dancing, laughter & good red wine: Vive Le Montmartre! This afternoon, Mom took me out to a lovely little French restaurant very close to where we live. The occasion was the celebration of my landing a new job which I'll be starting in about a week. I thought I should treat, but Mom being the generous lady that she is, insisted on treating me. "Besides," she said, "it's what your Father would've done!" Well, that's true... I think Dad only ever let me treat him to a meal once in his life. He loved to try new restaurants, but he always insisted on taking his family out and rarely ever let it happen the other way around. This restaurant is such a wonderful place, I felt I had to make a little plug for it. 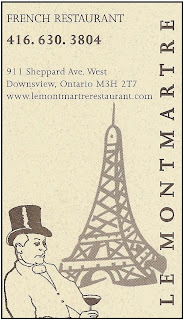 It's called Le Montmartre, and it's on Sheppard Road, just west of Wilson Heights Blvd. The owner, Marjie Caradant is a very sweet lady trained in Paris and Toronto. She took our order and handled most of the lunch time crowd by herself. The atmosphere was both classy and comfortable; simple and elegant - French music playing in the background, fresh cut flowers on the table, antique furniture, stained glass, and prints of late 19th century French artists on the walls. The outside of the restaurant is painted Provencal yellow which adds a nice burst of colour to an otherwise plain street. And the food - oh, the food! I had the Petits tournedos aux poivres vert (Beef tenderloin medallions flambéed with cognac, in green peppercorn sauce) and Mom had Le Foie de veau, sauce marchand de vin (Grilled provimi liver with shallots and a touch of garlic in a delicious red wine sauce). We loved it! I have to say, that was the best tenderloin steak I've had in a long time (medium rare is how I like it, and that's what I got - perfect!). Remarkably, I didn't have any wine with my meal, because I was feeling a little "headachey" before I got there. I'll just have to go back another time and sample one of their wines (they have an extensive selection) along with my meal. Next time, I'm treating, Mom! Please check out their site for more info. Le Montmarte is definitely worth visiting if you're ever in the North York area - and if you're not in the area, it's worth the trip! Wow...that's actually very close to where I live. Sounds like a good date-night restaurant!